Ignimbrite. (L. ignis = fire; lithos = rock). An ignimbrite is a poorly sorted pyroclastic rock derived from a sub-aerial flow (nuée ardente; Fr. glowing cloud) composed of ash, crystals, pumice fragments and glass shards. If very thick (3-10m), the heat and pressure in the lower parts can cause the pumice and the shards to soften, flatten and streak out to form eutaxitic, fiamme (It. = flame) texture. This cools and produces a rock which might also be termed a welded tuff with an obviously non-technical "streaky bacon" texture. The upper parts can remain less compact and partly consolidated so escaping gases can transport and deposit minerals in cavities (amygdales) between the pumice and shard clasts (Allaby & Allaby, p. 278). In Giffard Bay on the north coast, the Long Etchet Tuff near the base of the St. Saviour's Andesite is described as ignimbritic because it is very much more silicic than the adjacent tuffs and flows (Bishop & Bisson, 1989, p.17). 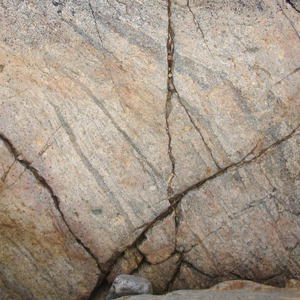 There are no other rocks described as ignimbrites in the various parts of the Formation. The main ignimbrite sequence comprises five thick units with several lava flow layers within each. 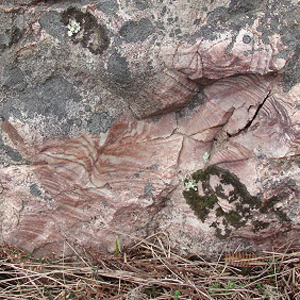 These crop out on the east coast as the Jeffrey's Leap and Anne Port Ignimbrites and are exposed as maroon and grey ignimbrites with the characteristic textures north from Petit Portelet via Jeffrey's Leap to the north side of Anne Port Bay where the eutaxitic and fiamme textures help one to distinguish the ignimbrites easily from the flow-banded rhyolites, the spherulitic varieties and the autobrecciated and agglomeratic types (Nichols & Hill, 2004, p. 22-23). On the north coast, the St. John's Rhyolite Formation is represented by the Bonne Nuit Ignimbrite and then the Frémont Ignimbrite; they are separated by two units, the Bonne Nuit Tuff and Andesite. In these dark grey to pink ignimbrites, there are fewer fiamme and eutaxitic textures but the units contain a great number and variety of xenoliths. Certain ignimbrite banded structures in Giffard Bay have recently been described as 'rheomorphic' (or flow) structures (J. Sonnex, 2008, G. Mason, 2014 pers. comm). At present there is some discussion about whether the banding is due to original flow (below left) in the burning ash cloud (nuée ardente) or to later compression (below right). The ignimbrites of Anne Port are succeeded by five rhyolite flows of the Bouley Rhyolite Formation starting with the Anne Port Rhyolite as far as La Crête Point and Le Havre de Fer. These exhibit a greater variety of textures, the most obvious of which are flow banding and spherultic, but there are also rubbly and autobrecciated intervals and tuffaceous units. They are followed by a sequence of ignimbrites northwards from Archirondel breakwater to St. Catherine (the Archirondel, Dolmen and St. Catherine's Ignimbrites) with interbedded tuffs, all exhibiting the textures already described but also with pumice, quartz and albite fragments in a felsite matrix, often replaced by haematite. However, eutaxitic and fliamme textures show that these are ignimbrites. Two outcrops of these units occur to the south, as islets east of La Crête Point (NB. indicated by different symbols on the maps, Bishop & Bisson, 1989, p.27 & 37). They have been faulted into these positions, presumably down thrown to the east given the dips, rather than having been tear-faulted. Here, they contain the characteristic textures, such as black fliamme, but in a green groundmass, and again one finds various xenoliths but generally of pink ignimbrite. Petit Portelet to Anne Port & St. Catherines Bays. Upper Bouley Ignimbrite (pink) St. Catherines Ignimbrite Bouley Rhyolite Fmn. (N. side A. Port Bay) St. John's Rhyolite Fmn. Bishop, A. C. and Bisson, G. 1989. Classical areas of British geology: Jersey: description of 1:25,000 Channel IslandsSheet 2. (London: HMSO for Brit. Geol. Survey).